Your pet’s diet is one of the most important elements of their overall health and well being. It is also one of the areas of their health that you have nearly complete control over. For that reason, it is a pet owner’s responsibility to make sure their pet is eating nutritious, wholesome foods. If you are not paying attention to your pet’s diet, you could be costing them years off their life, not to mention a lower quality of life as well. One of the main ways you can be a nutrition-conscious pet owner is by reading pet food labels. This will allow you to determine the quality of the food you are providing while also having a great understanding of your pet’s digestive system. Being knowledgeable about your pet’s food also provides our veterinarians with more information when we are assessing your pet’s health. Many health issues are often related to diet, so you can help us get a clearer picture of your pet’s health by being aware of the ingredients in the food you give your pets. The two main things to look at are the food’s ingredients and guaranteed analysis. The ingredients are a list of the elements that make up the food, while the guaranteed analysis shows the levels of protein, fiber, fat, or other nutrients within the food. There are also a variety of different types of foods. 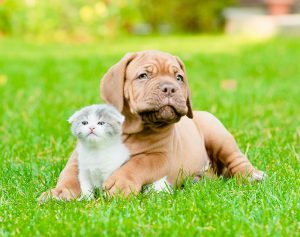 Whether you are looking at natural or holistic foods, foods designed for specific life stages, of formulated foods, it is important that you understand which diet is most suitable for your individual pet. The best way to determine this is to talk to our veterinarians and learn more about your pet’s digestive requirements. As you can tell by now, there is a lot that goes into your pet’s food. As such, it’s vital that you understand the differences between different pet foods and how they will affect your pet’s digestive system and overall health. If you have any questions, comments, or concerns, please don’t hesitate to contact us today.